The start of the rainy season in the Philippines (around June) usually coincide with the start of school. So the beginning of each bring back jaunted memories of smell of new pencils and erasers (rubber), smell of the plasticky-rubbery new umbrellas, bags and shoes, wet grass, newly wet earth, cool humid afternoons. In a way, the rains are welcome respite from the intense heat and humidity of the preceding March-April. Though at the back of the mind is that wariness of the typhoons that are sure to come anytime to wreak havoc on people's lives and properties. For kids, typhoons are greeted with joy - school's closed, no classes! They bathe in the rain, some even in flood waters (not safe). But for me it comes with that snug feeling of warmth with all the family forced by the weather to be inside the house. My grandparent's house in Cavite where I grew up had those sliding capiz windows. They’re not water or windproof so come typhoons, we grandkids with our aunts race around the house stuffing edges and joints of windows with rags to prevent the rainwater from coming in. While my lolo (grandpa) goes out with these big abaca ropes to tie down the haligi (pillars) of the house and other trees around their yard. As for the food, since there was no market, all our food are simple and lots of times comes from the 'victims' of the typhoon. So we often had the crops of those uprooted and damaged by the wind - kamote (sweet potatoes), saba banana, butuhan banana, balinghoy (kamoteng kahoy, cassava), kangkong (tung choi), talbos ng kamote (sweet potato tops), etc. These are cooked simply - meaning boiled or steamed - then eaten hot. Sometimes when the storm lasts for several days and we've had enough of boiled this and boiled that. My grandma would grate some balinghoy and steam it then serve with freshly grated coconut sprinkled with sugar. We call this 'kalangkang'. 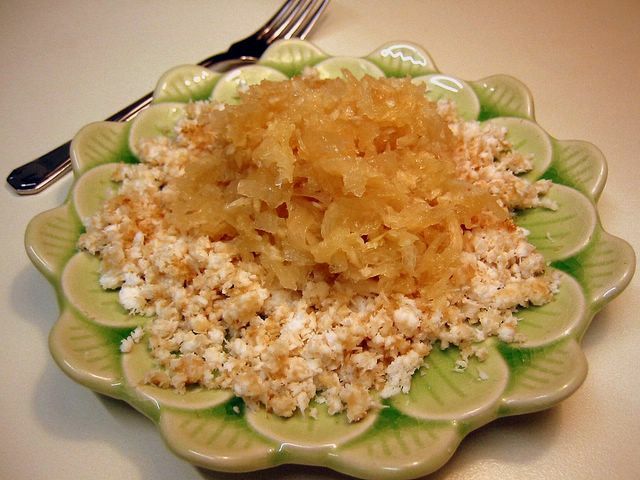 The combination of the soft, slightly gelatinous cassava and sweet grated coconut is simply divine! Sometimes the simple things in life are the best. 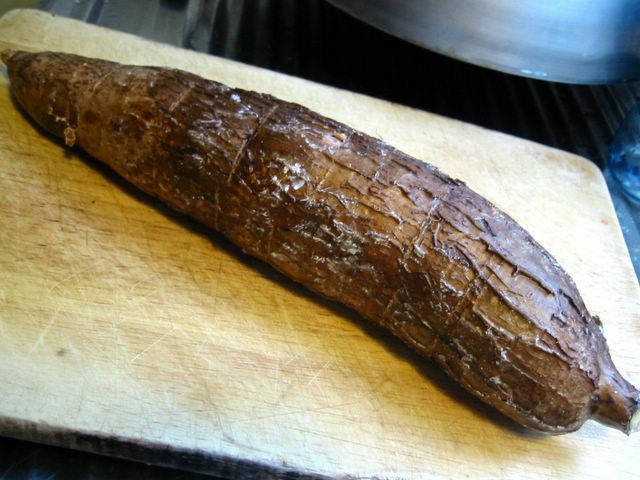 (It's best to grate the cassava finely to have shorter cooking time.) Put the grated cassava on a very lightly greased bowl or plate. Place bowl in a steamer and cook on high steam for about 30 minutes or until cassava is translucent and soft. Serve hot or warm with grated coconut sprinkled with sugar. The glut of apples in autumn time is very much welcome to my son, J1, who adores apples in baked products. May it be pies, pastry, bread, or cakes. For sometime, the two of us have been trying out different versions of classic apple pies (of course with me slaving away while he does the tasting) to see which ones will have the honor of staying in our family recipe list. One of them is this pie with a streusel topping. 'Streusel' according to the Joy of Baking glossary, is a type of cake or pastry topping, German in origin, and has a base of flour, butter, and sugar in which spices, nuts, and other ingredients are added. I adapted this from my beloved battered Let's Cook with Nora by Nora Daza. 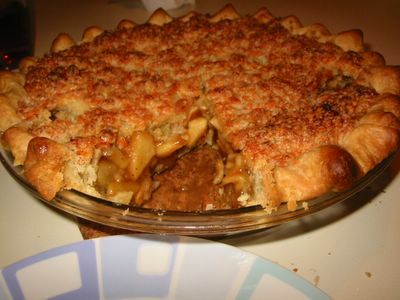 I remember well the second time I baked this, I was so distracted with the things going on in the kitchen that I forgot to add flour to the sugar mixture used to toss the apples with. It turned out like an apple pie soup! Crusts at top and bottom were fine but the middle was so wet I was ladling it out when serving. :LOL: Then another time, I forgot to put milk with the topping ingredients. Whatever it was, seems this pie always get shortchanged. ;) So this time I banished all the kids from the kitchen and had a run down of the ingredients to make sure everything is in there. The only thing that I think I have to tweak is the cooking time since even after 40 minutes some of the apple pieces were not fully cooked (not that we mind ...) hence I put in 55 minutes in the recipe below. About our taste preference, we don't like our apple pies too tart and not too sweet as well with just a tad bit of saltiness in it. 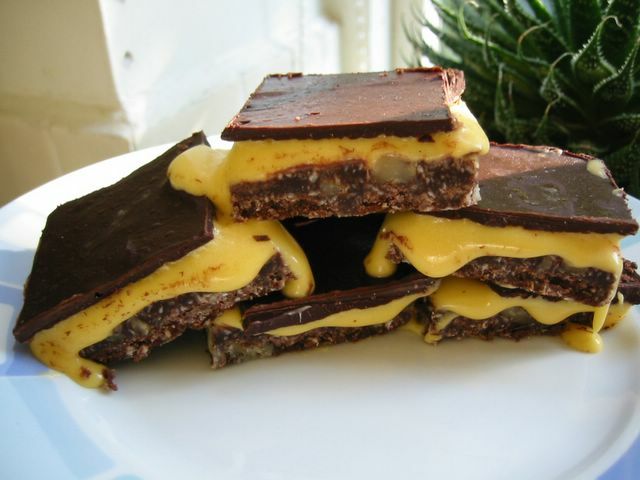 This one has that kinda savoury-sweet tang in the topping courtesy of the cheese. The sugar in the filling was reduced a lot and the bottom crust is oh so flaky and buttery. Nice. Put the flour and butter in a bowl. Cut the butter into the flour with a pastry cutter or two butter knives until mixture is into a crumbly state. Sprinkle enough water and toss until you can gather the dough into a ball. 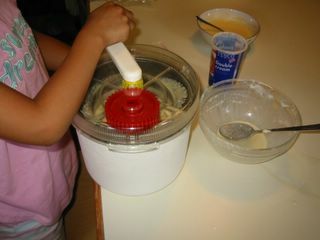 Press, turn and gently knead to just about bring it together until the doughball is smooth and the texture uniform. Caution: do not over knead of it will become inelastic and stiff. Wrap or put in a plastic bag and chill in the fridge for 30 minutes. On a clean, floured surface or between greaseproof paper and cling film, roll flat evenly with a rolling pin into a circle shape with a diameter of about 11 inches. Prick crust all over with fork. Combine all ingredients except the apple in a container and mix well. Toss the chopped apple in the spice mixture. 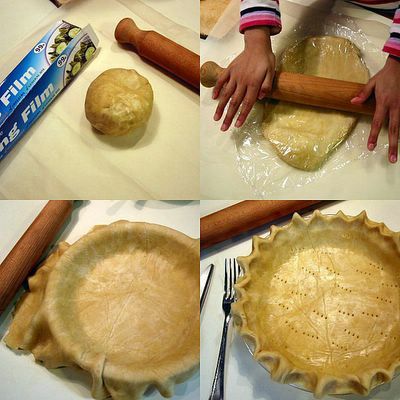 Put and arrange into the unbaked pie crust. Cut in butter with a pastry cutter or two butter knives until crumbly. Add in cheese and toss to combine. Sprinkle milk and mix well. Spread to cover top of apple mixture. Bake in oven for about 55 minutes. If the crust and topping is browning too much, coverly loosely with aluminum foil. Remove from oven and cool. Serve warm or cold. Disaster anyone? This was meant for the SHF 12 with a theme of custard but as you can see these Nanaimo Bars were not exactly a paragon of beauty. I don't know if I did anything wrong or there's something inherently flawed in the recipe itself. 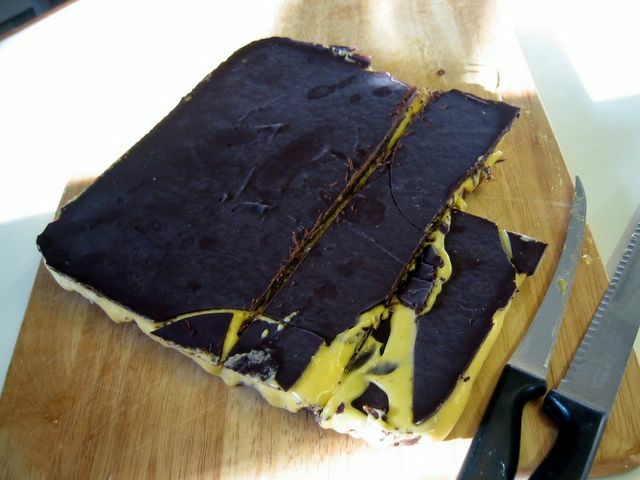 Mind you, it was only the middle custard part that didn't work. The base and topping were great but as you can see the middle layer is sooo gooey, it just collapses during cutting so I had to freeze it first *overnight*. Come morning, it was still gooey while the bottom and top were rock hard. I tried hack it off with a variety of implements - bread knife, carving knife, chef's knife, etc. Could I have tried an axe? ;-p I tried warming the knives first but to no avail most of them still broke up though there were some little success but it's that darn custard that won't set !! Maybe I should have just served it on the side because the rest of it is absolutely delicious. Grease and line a 9-inch square baking pan. Put the butter, sugar, cocoa, egg, and vanilla in a heatproof bowl and set over a saucepan of simmering water. Melt the mixture while stirring constantly. When it becomes smooth and slightly thick, remove from heat. Add in the biscuits and walnuts. Combine well. Press onto the prepared baking pan making sure to level it out. Chill in the fridge for at least 30 minutes. In a heatproof bowl, beat together the softened butter and custard powder. Beat in the icing sugar, egg and vanilla. Place carefully on a larger bowl filled with hot (not boiling) water. Continue beating for about 1-2 minutes. Leave for 5-10 minutes in the bowl of hot water then beat again for another 1-2 minutes. Tip this over the chilled base. Chill in the fridge again for at least 30 minutes. Put the butter, chocolate, and sugar in a heatproof bowl. Melt by putting the bowl over saucepan with simmering water. Stir until well combined and smooth. Tip on top of the chilled filling and base. Cool completely, then chill in the fridge for at least 30 minutes, then freeze for about 3 hours. Cut into squares while still cold and hard otherwise they will breakup. Note: You can substitute vanilla pudding powder for the custard powder. 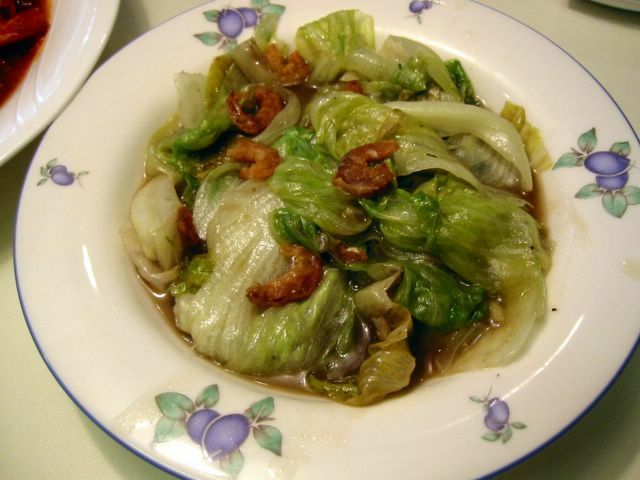 I was hoping to include this recipe of my maternal grandfather - Lolo Apeng - when I 'introduce' him in this blog. But circumstances in the other place where I blog caused me to post this to give an example of a Filipino dish that needs a boost in the presentation department. Anyhow, it tastes better than it looks - that I can assure you. 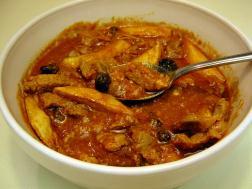 The dish is something that my late grandfather came up with by combining the virtues of bistek, menudo, and afritada. Since he passed away already, nobody in my family knows why he named it Gisok. A mainstay in all of our family buffet table in Cavite, this is often requested by guests and relatives who have had it before. Our neighbors there even used to ask my lolo to prepare it for them. I hope you like this, too. Cut the pork and liver separately into long and thin pieces about 1-2 inches long and about 1/4 - 1/2 inches wide. Combine the 1/4 cup soy sauce and lemon juice in a bowl. Taste and add more lemon or soy sauce according to preference. Marinate the pork in this mixture for at least 2-3 hours. In a large pot, heat the oil and saute the garlic, onion, then tomatoes. Add some salt. Add the pork including the marinade. Cook for a minute then cover the pot and simmer for about 5 minutes. Add the chorizo, passata, tomato puree, soy sauce (if using) and water. Bring to boil then simmer until meat is tender. While it's cooking, deep fry the potatoes. Set aside. Add the liver to the pot, cook for about 5 minutes. Add the raisins, cook for 3 minutes. Add the grated cheese and half of the potatoes. Cook for a further 2-3 minutes or until cheese is melted and well incorporated in the sauce. Remove from heat. Ladle into serving bowls and scatter some of the remaining potatoes on top. Originally popular in Victorian times, the Madeira cake was named after the wine that traditionally accompanied it. 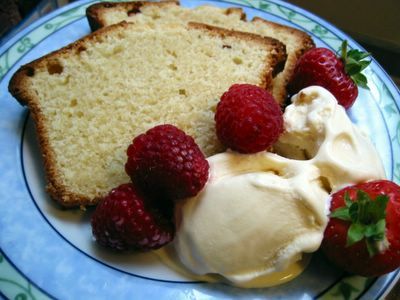 Nowadays, tea is the usual companion of this very buttery cake. 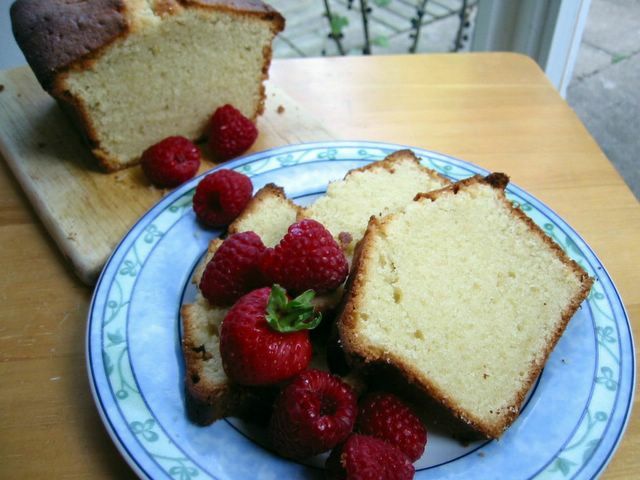 This is very similar to the pound cake, with the main difference having to do with the addition of lemon zest and/or lemon juice for the former. Preheat oven to 160°C/fan 140°C/325°F/gas mark 3. Grease and line bottom of a 2 lb (9 x 5-inch) loaf tin. Cream (beat) softened butter and sugar for about 5 minutes or until light and fluffy. Add in the lemon zest. Stir in 1 egg - mix, then a third of the flour and all of the salt - mix well until well combined. Repeat the procedure adding the egg one at a time followed by the flour always mixing well after each addition. Finally, add the lemon juice, combine well. Pour into the prepared baking pan making sure to level the top. Bake in oven for 45 minutes then lightly cover the top with foil and continue to bake for another 15 minutes or until a skewer poked in the middle comes out clean. Take out of the oven and cool in the baking pan for about 20 minutes then remove from the pan and cool completely on a wire rack. Best served sliced with some whipped cream or ice cream. The last time we made this from scratch was more than 6 years ago. So long ago that when I took out our manual ice cream maker some white bits of it was slightly yellowing already! But I froze the base, made my youngest daughter J3 do the churning and it was still fine. This is great to make with the kids since they find it fun turning the crank at the same time making rich vanilla-y ice cream. It was yummy! Combine the egg yolks with the sugar in a bowl, set aside. In a heavy bottomed saucepan, bring to boil the milk slowly. Once bubbles start to appear along the edges, pour about 1/4 cup of the hot milk in the egg mixture while stirring. Once cool, fold in the cream and vanilla. Churn in your ice cream maker following manufacturer's instructions. I wanted some gulay (vegetables) to go with the meat dish we have that night. But at the time our fridge was not exactly heaving with veggies in fact all we got was some leftover iceberg lettuce. I didn't want to munch on cold salad *again* so stir frying seems to be the way to go. Huang Su-Huei's Chinese Cuisine cookbook gave me the base recipe to adapt for this dish. Mix stock, salt, black pepper, cornstarch in a bowl. Set aside. Soak dried shrimps for 30 minutes or until soft. Drain and set aside. Heat oil in a wok until smoking hot. Stir fry green onions until aromatic. Add shrimps, cook for about half a minute; then add lettuce and cook in high heat until limp. Add stock mixture and cook until thick. Serve. Or better yet donate in your local charities. Now, let's get on with blogging ... this month's Lasang Pinoy theme is food you associate with typhoons, hurricanes, or storms. 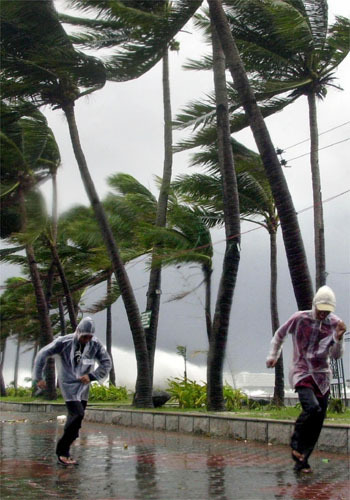 The Philippines' wet season (June-October) is synonymous with typhoons. Average of 19 of these severe storms hit the country usually originating in the vicinity of Caroline Islands in the Pacific Ocean. So many typhoons in fact, that it has been an indelible part of most Filipino's way of life. I say 'most' because not all of the whole archipelago experience the same weather at the same time. The southern region of Mindanao, for example, do not have as much typhoons as compared to the Eastern Visayas and Luzon region. A good backgrounder on the Philippines' climate and seasons can be found in Pagasa and Food and Agriculture Organization websites. Because of the yearly deluge, Filipinos are used to adversity brought on by it so coping with natural disasters is nothing new as it gets exercised every year. The general mood after one too many in this disaster prone country is that - yes it's a tragedy, yes it's a shame on what we have lost, but life must go on and Pinoys pick up the pieces right after and try to rebuild each and everytime. No wonder one of the Pinoy's characteristics is the ability to cope with pain and hardship. And be pliant like a bamboo swaying and bending with the whatever the winds of fate brings. 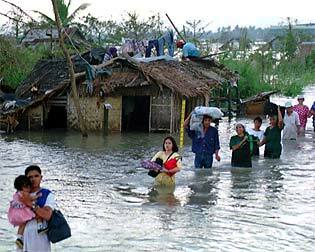 Typhoons and storms may mean high winds, deluge of rain, floods, and consequently devastation. However, it can also conjure up memories of feeling of closeness and warmth from the being cooped up inside the house, of silly games played to pass the time, of boys and girls sharing an umbrella, even of kids playing in the rain or worse(?) in the floods. And what food we had during those times! Body warming soups, hot boiled root crops, canned food, etc. So you homework ;) now is to blog about Filipino food that you associate with typhoons, hurricanes, or storms. Try to remember what you served or have been served during a wind and rain-lashed night. Is it hot and soupy? Is it coming straight out of the can? Is it cold because there was no electricity/gas for the stove? Or maybe blog about food you have to eat to survive. Do indulge us with your 'typhoon specialties' and regale us with your stories. The Food of Italy cookbook provided the original material which I adapted. Heat the olive oil in a saucepan or pot in low heat. Saute garlic and chillies until garlic is light golden brown. Keep the heat low to prevent the garlic from burning. Add the tomatoes and season with salt to taste. Simmer gently for about 30 minutes or until sauce is thick and rich. Meanwhile, cook the pasta according to package instructions until al dente. Drain and drizzle a little olive oil to prevent it from sticking to each other. Add the basil to the sauce and season again just before serving. 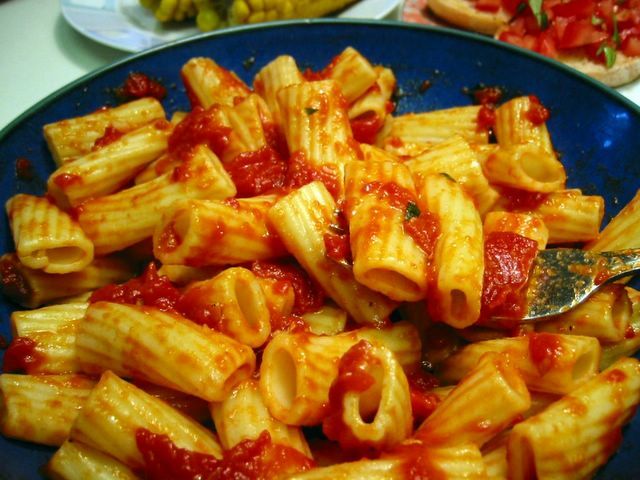 Toss the pasta with the sauce and serve. *Note: If using fresh tomatoes peel it first - lightly score the bottom of each tomatoes with two lines crossing each other. Blanch the tomatoes in hot water for about 30 seconds. Drain. By this time the tomatoes should be easier to peel, simply pull off skin from the bottom and all around.